Great Bridge North opened in 1850 as 'Great Bridge' on the then-LNWR's South Staffordshire Line between Wednesbury and Dudley Port Low Level with the 'North' being added in 1950. Unfortunately, as with the South station there is little left that would indicate a station had ever stood at the site with considerable associated goods facilities. The above shot from 1950 (photo: John Edgington) shows the extent of the railway workings which once existed at the site. Above-left we are standing on the New Road overbridge looking along the tracks in the direction of Wednesbury at the area once inhabited by the station. 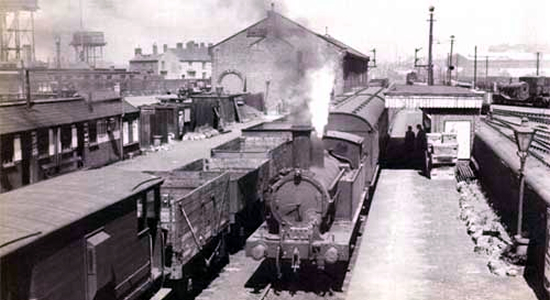 Most of the station facilities and buildings stood to the left of the tracks as we are looking at them in this picture. Above-right we are back on New Road watching the preserved trackbed heading towards Dudley Port Low Level - the trackbed has been 'mothballed' for a proposed extension of the Midland Metro system should this ever materialize (for more info, go to the Midland Metro page). Above-left we are on Eagle Lane looking at what stands on the site today - a residential development (well, it makes a change from car parks, supermarkets and factory centres). The flats here are standing almost exactly on the site of the station buildings: the trackbed seen in the previous picture is behind the flats with New Road being to the right of the shot. I have to admit that I was beginning to feel a little despondent wandering around both this and the South station's sites as there didn't seem to be a lot of interest (if any) remaining. 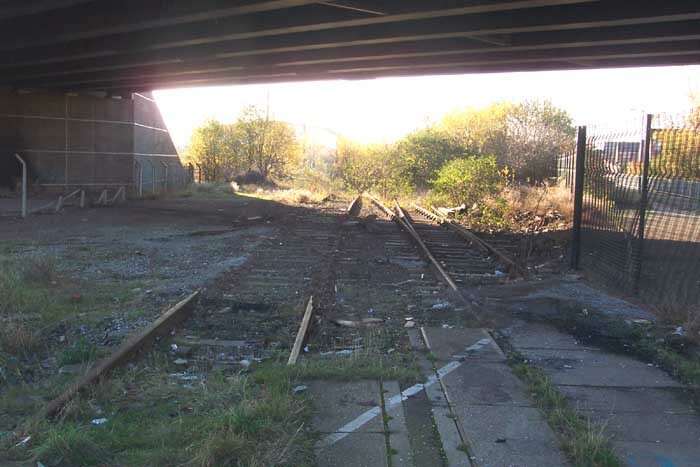 However, my interest was rekindled when I discovered the remains of a level crossing which spanned Eagle Street and can be seen in the photograph above-right. 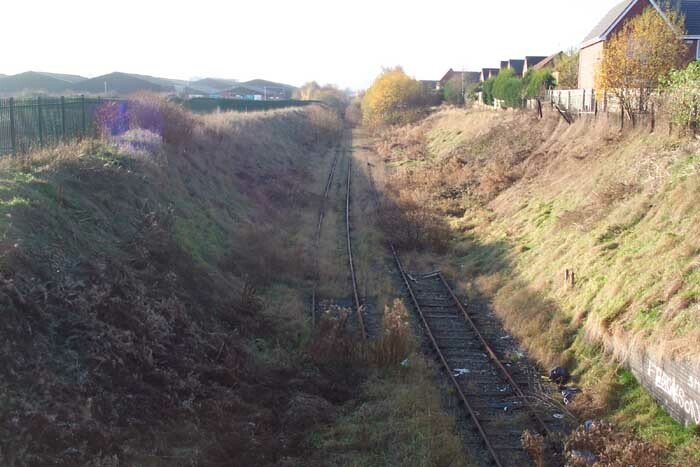 The photograph is looking towards Wednesbury with the station site behind the photographer - Eagle Street now effectively ends just short of the level crossing and turns into a walkway leaving the trackbed in a sort of no-man's land in the shadow of the recently constructed A41 Black Country Route which crosses the old path of Eagle Street via a large bridge as the A41 is on an embankment: the level crossing is under this bridge. Above-left we are still under the A41 bridge (which can clearly be seen and accounts for the bad lighting) but this time looking back towards the station site from the level crossing. 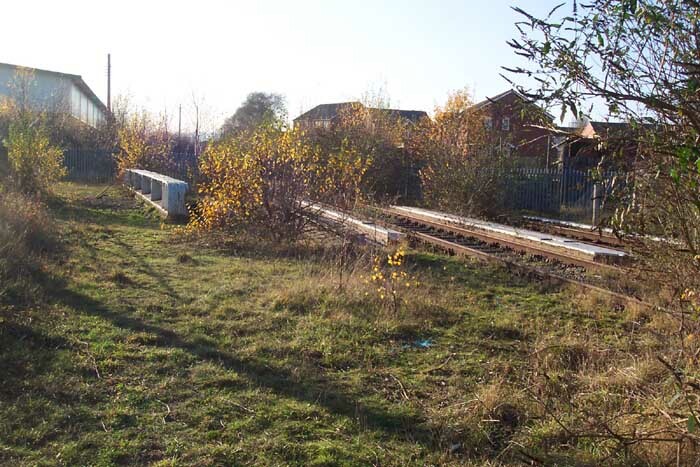 The trackbed here is in an appalling condition with a couple of lengths of rail removed and the odd wooden sleeper disappeared (probably in someone's garden!) 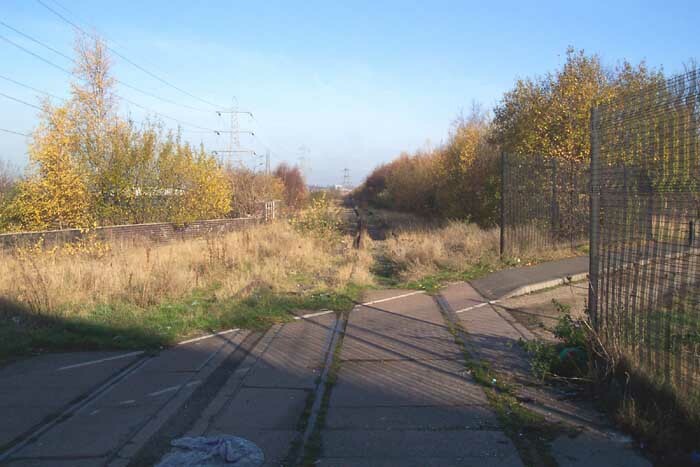 - this is not surprising as it is in a secluded spot and despite high fencing running along the length of the trackbed, the end which opens onto the level crossing site is ungated/fenced. 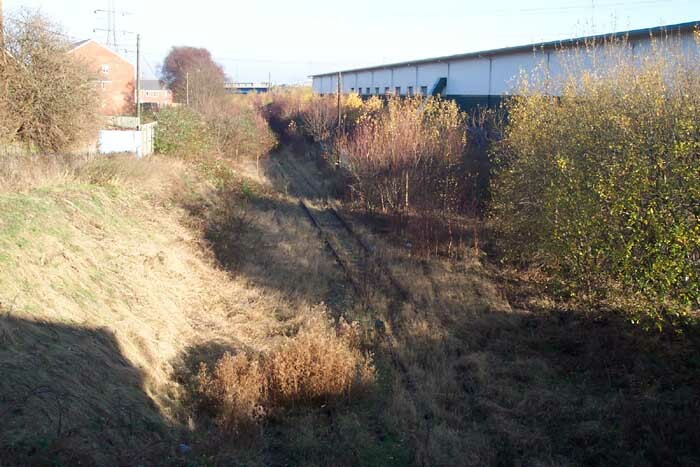 Above-right we have walked 30 yeards-or-so forwards from the previous shot and can clearly see the girder supports which carried the railway over the Walsall Canal: the station site is straight ahead beyond the bushes.